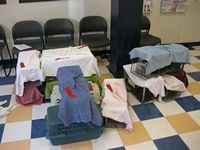 On Sunday, Feral Fixers brought in 14 more cats to the PAWS-Chicago Spay/Neuter clinic to have the 'Neuter' portion of the 'Trap-Neuter-Return' process performed. Super-volunteer Jennifer brought them in (Thanks Jennifer!) while I picked them up and brought them back to Tammy's to start the 'Return' part of the process. 12 of the cats were true ferals while 2 were 'friendly ferals'. The great majority of the ferals were females, so we have surely stopped several litters of outdoor kittens which would have been occurring in the next couple of months. The picture thumbnail is of the 14 cats as I picked them up on Sunday. If you click on the thumbnail, you'll see a full-size version of the picture. With these 14 cats, Feral Fixers has now processed 54 for this month, 309 for the year and 1,788 overall.